I have spent most of my professional life working on and fixing networks, and always want my personal network to be as reliable, speedy, and full of features as possible. My boats are no exception, and while I’ve written about Grace’s network before, I’ve never focused on the Internet/WiFi portion of it in detail. It’s obvious that boaters are interested in varying approaches to this, given the popularity of my recent article on Marina WiFi being hard to implement. So, without further ado, here is a deep dive on my network, and the things I like / dislike about it. 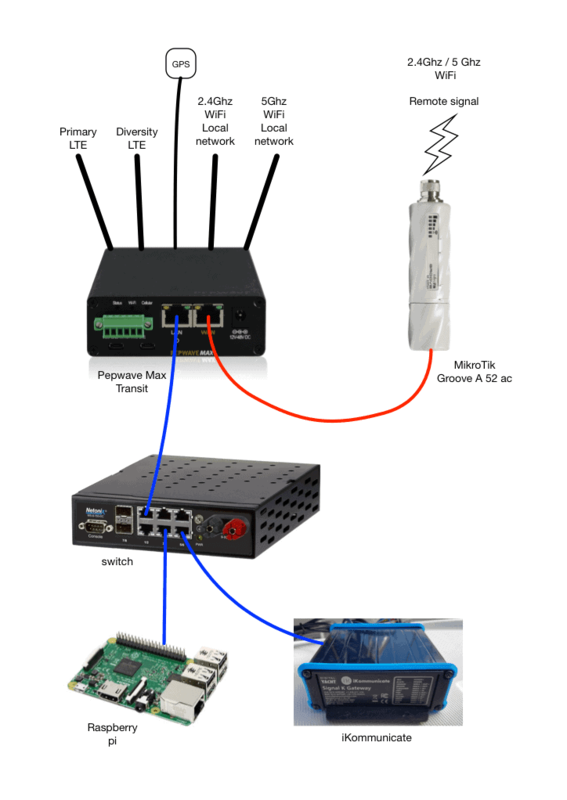 There are two major components to my system – a high quality, multi-function local router (Peplink MAX Transit) and a dual-band WiFi repeater/router (MikroTik Groove A 52 ac). 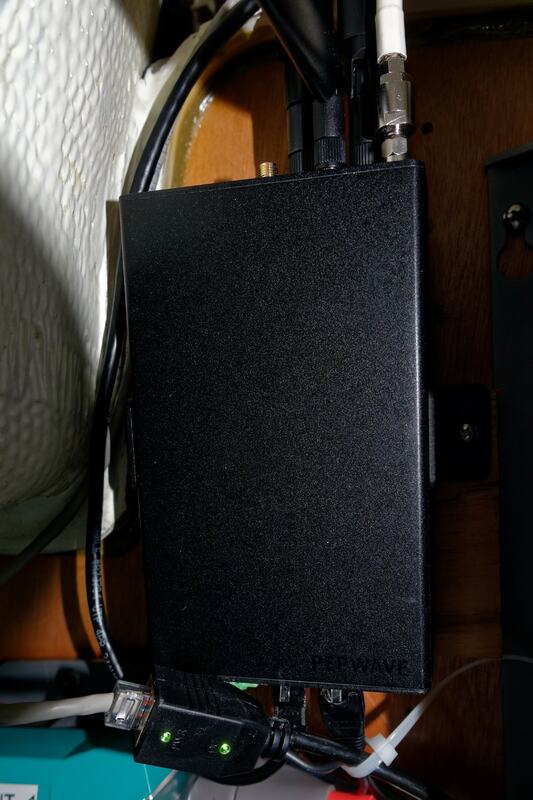 The Peplink is the core of the system – it provides a local WiFi network on both 2.4Ghz and 5Ghz bands, a LAN port to connect wired devices to via a downstream switch, a WAN port to connect the MikroTik, and dual SIM slots to connect to a cellular carrier for Internet access. 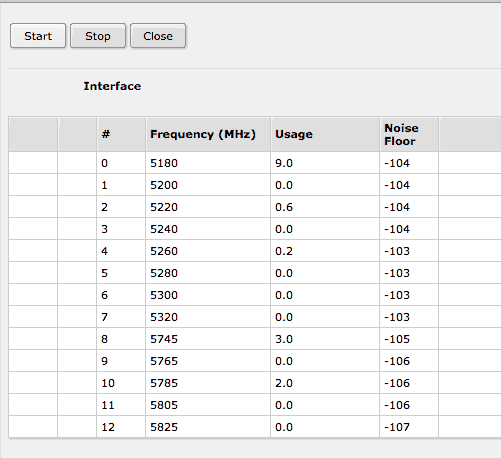 The MikroTik allows me to connect to remote WiFi signals. It’s connected via an ethernet cable directly to the Peplink WAN port. It supports both 2.4 and 5Ghz WiFi networks, giving me more options for connecting. Having a dedicated device to grab WiFi signals is critical to having a quality, high speed connection. This allows me to avoid using LTE data plans in places where WiFi exists. 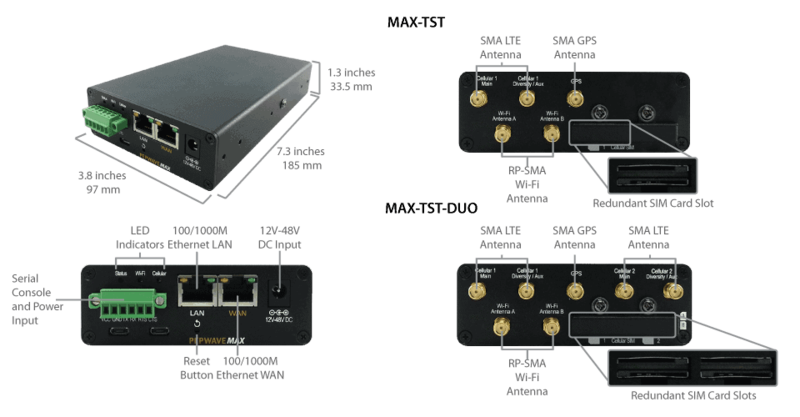 In addition to the two core pieces, there is an outdoor LTE antenna SureCall SC-288W to ensure a strong signal, high quality ethernet cabling everywhere which is run far away from interference, a wide voltage range PoE injector for the MikroTik, and everything runs off of 12v DC power to be left on 24×7. The full list of features is on Peplink’s page near the very bottom. The device is very compact, and the industrial design is beautiful. On the bottom of the unit is the power connector block which is removable to allow for ease of wiring, and also has connections for a serial port interface, which I do not use. Below that are two USB micro ports that could drive wireless dongles or other devices, which is a nice touch. There are some status LEDs, LAN and WAN port, and a standard wall-wart power jack as well. On the top are a ton of connectors for all of the antennas – two SMA LTE antennas, one GPS, and two RP-SMA for the local WiFi networks it creates. I use both AT&T and Verizon SIMs in the Peplink to allow me to connect to whichever provider is stronger wherever I am traveling. 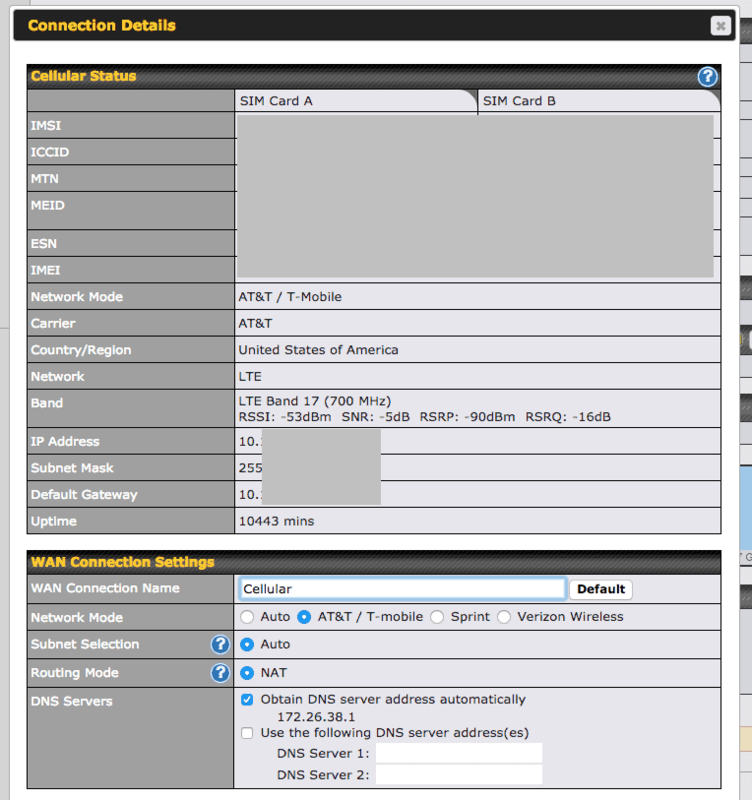 At a quick glance, you can see which SIM is in use, signal strength, IP addresses, and other useful info. If you delve a bit deeper, you can find settings which allow for granular control over which SIM to use, how to check whether things are healthy, and many other configuration choices. This is one of my favorite parts about the Peplink – being able to setup two completely independent LTE cell phone providers, and having it fail back and forth to whichever is more available, has more data, etc. This allows for always-on connectivity without having to change settings, swap SIMs, or even interacting with the device. The MAX transit is one of very few products I have used that has both 2.4Ghz and 5Ghz WiFi radios in a compact, mobile package. Most devices are still only offering 2.4Ghz which is very congested in most marinas. Having 5Ghz provides super fast and speedy WiFi signals to all of the modern devices on the boat, especially guests and mobile devices. This is especially true given that 5Ghz works much better over short ranges, and that means people on the boat have speedy, reliable connections. In the picture above you can see the two WiFi antennas pointing straight up, one for 2.4Ghz and one for 5Ghz. In front of those are the two antennas for LTE / cellular connections. One is pointed straight out in this picture (the one on the left) and the other is connected to a cable leading to the external antenna out on the stern rail. Few WiFi routers on the market have DC power input and even fewer have an input range from 12V-48V. Add to that the super convenient power block for wiring, and you have a great router ready to run off of boat power. I like this feature mainly so I don’t have to worry about AC inverted power, converters, or the like to ensure the Internet connection is always on. Additionally, it provides a measure of security – I have mine wired in via a dedicated fuse to the battery bank so that it is always on, regardless of whether house power is on or off. There are too many features in the Peplink to cover in this post, but suffice to say, it is one of the most powerful and feature rich routers I have used. In fact, I have their small business products at home and the family cabin and have quite complex networks. For the boat, there are many great features, such as the dashboard above, that can help in troubleshooting problems, and provide tons of information and options. One of the most critical and best implemented features is the priority WAN connection control. Above you see I have my LTE cellular connection in first priority, and then my MikroTik in Priority 2. This allows for near seamless switching between these connections in case of a failure, or just while changing locations. 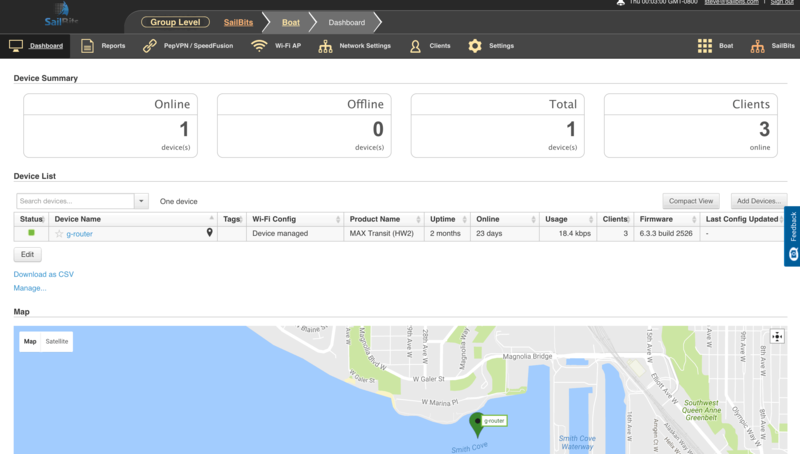 It’s so good, I don’t ever have to change things – when we’re at a marina connected to WiFi via the MikroTik, we can just pull out and leave, and the system will note when the WiFi connection drops, and simply start using the LTE connections. Crew have been using the Internet while this happens, and never notice a thing. One of my other favorite features for the boat is bandwidth reservations. This allows me to setup groups of people – Manager, Staff and Guest above – and allocate specific amounts of bandwidth to them. 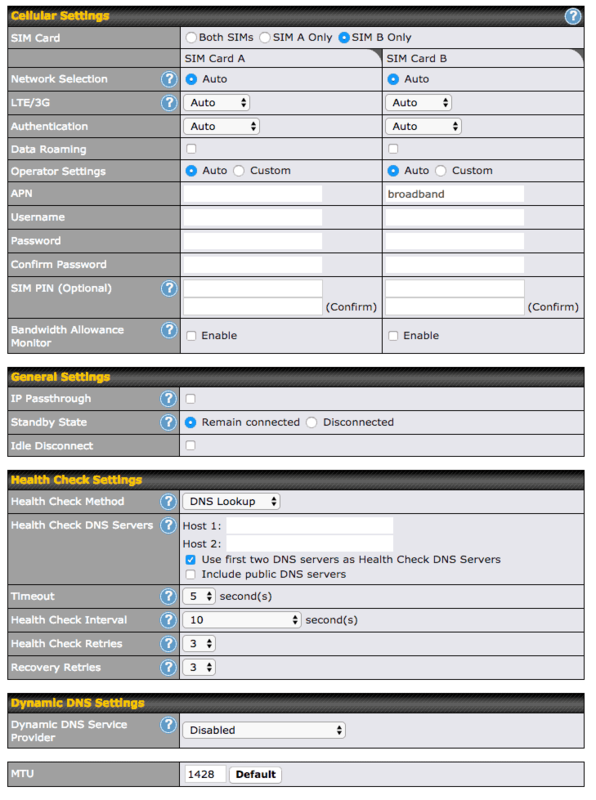 You can even set individual user bandwidth limits. This is super helpful on the boat when we have multiple people all trying to stream Netflix or post videos or pictures from the day’s events. They fall in the “Guest” category, and if the connection is saturated, only get 1Mbps to work with. The Staff group is for my devices so that I can have a bit more bandwidth while planning and doing boat stuff. Critical devices like the chart plotter, AIS, and my SignalK devices fall in the Manager realm, who have more bandwidth and never are squashed. For Windows PCs and iPhone users, this is especially critical. Both of those devices have the tendency to completely saturate a connection either downloading updates (Windows 10 is particularly bad) or uploading photos (iPhone) and everyone else suffers. iPhones are particularly bad if you use iCloud to backup your photos – we’ve had a few guests on the boat that take lots of pictures of the day’s activities, and without these limits, would use a ton of bandwidth. 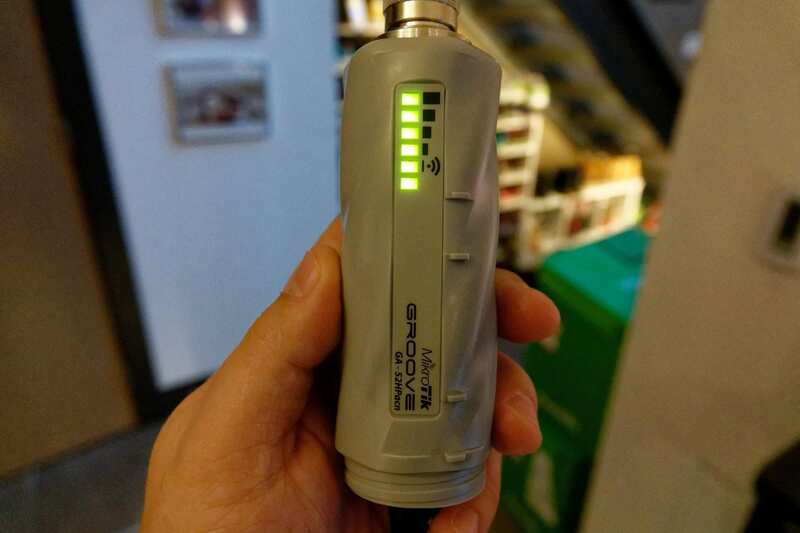 The MikroTik Groove A 52 ac (a mouthful!) 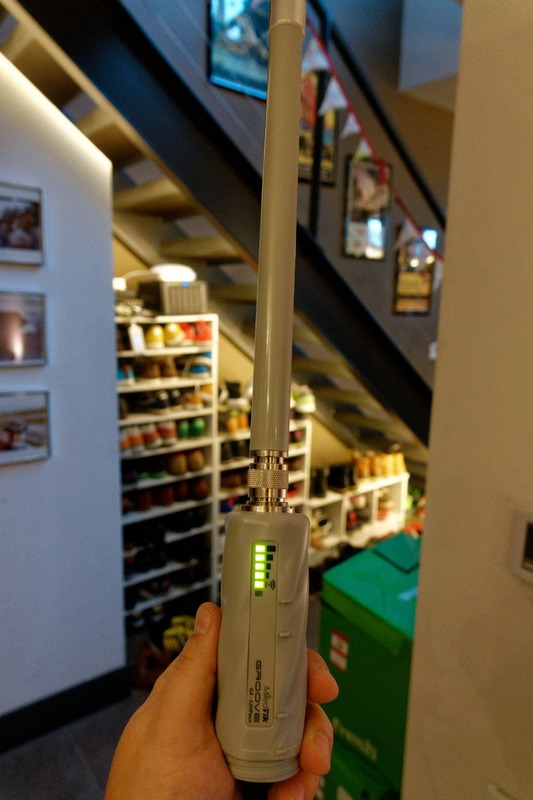 is a nice piece of hardware designed to grab remote WiFi signals via an antenna, and share them with an Ethernet port. 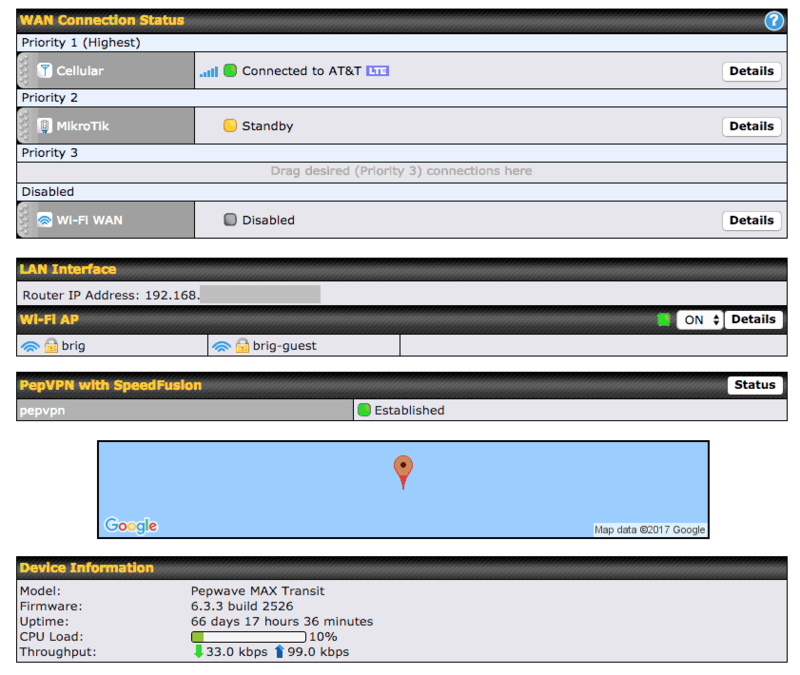 It can also be setup to be a bridge, router, local WiFi point itself, and a bunch of other configurations. In fact, if there is anything wrong with the MikroTik, it’s that it’s too much of a swiss army knife, and can be a bit overwhelming to configure. 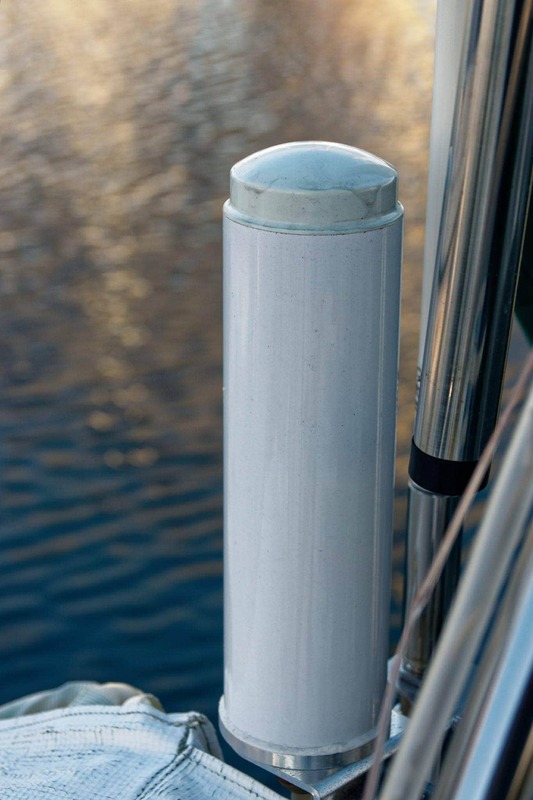 It’s weather-proof and can be mounted outdoors – I have mine on the stern rail of Grace. Many people have had issues with the Rogue Wave and Ubiquiti Bullet (same hardware in those two units) failing because of marine weather conditions. The MikroTik is slightly better in my opinion, but will still likely have a failure in a year or two. I don’t mind as the technology for WiFi networks changes so rapidly, and these devices are so cheap ($79) that I can buy a new one every 2 years. If you invest in a Rogue Wave or other custom solution, it’s a different situation – having to pay $300-400 every 2 years is definitely not a solid choice in my book. The base unit has helpful LEDs that tell you whether it has a LAN connection (bottom) and then the signal strength of the WiFi signal it is connected to. While I’m out in the cockpit, I can glance over at it and easily determine whether we have a stable WiFi connection in whatever marina we’re in. On the bottom of the unit is the ethernet port, and a reset button, which you want to become familiar with. MikroTik has a very complex UI called RouterOS and you can definitely lock yourself out easily if you are not careful. 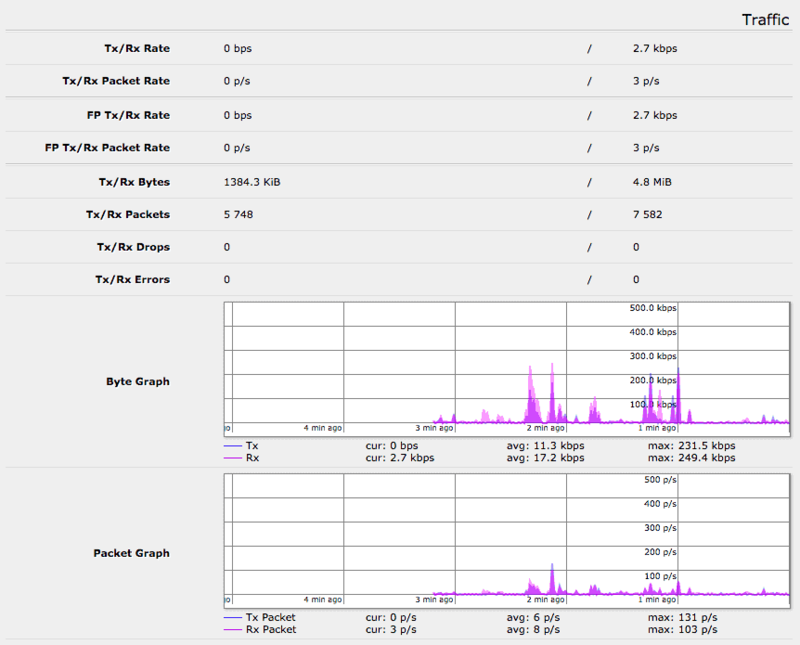 The main screen within RouterOS gives you a wealth of information about the connection, speed, strength, network settings and a graph of signal strength. On the left hand side you see the menu for all of the various options – each of those options have at least 3 other sub menus – some have 10-20. This is one of the challenges with MikroTik & RouterOS – it has a ton of options and features, and is extremely complex to configure if you get deep in the menus. RouterOS is a full-fledged router operating system, capable of being an enterprise solution with all of the bells and whistles. For my use, I configured basic routing, DHCP, and then a bit more in the WiFi area to configure the security settings and SSIDs to connect to. RouterOS is fantastic at giving you a wealth of information on the networks around you. 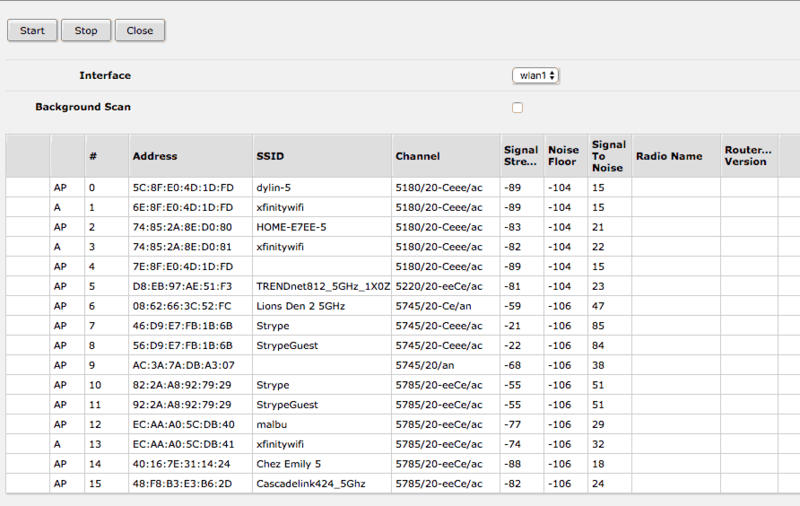 Above you can see the various networks near me while testing, and all of the channel and signal strength information. When visiting a marina, this information is very useful in choosing the best network as well as access point. There are even more details if you click on each AP, and more screens throughout the interface that can be very helpful. Another useful feature that I have not seen elsewhere is the ability to scan networks and get a channel list and usage numbers. This allows you to see which channels are too busy for good communication, and avoid connecting to an AP that is on those channels, or plan other connections. The depth of control over the WiFi radio (among other things) is pretty stunning, almost overwhelming. The basics are there, including channel, frequency, SSID and more. On top of that, you can get as detailed as channel chains, guard interval, and even more. This screen shot only shows about 1/3rd of the total options you can configure. While this is great if you need that power, for most users it will be overwhelming. You can also see a ton of other options at the top of the screen to setup the connections, provide a list of preferred networks, and much more. The amount of options is great, but again can be completely overwhelming to a normal user. I plan on posting a follow up article on how to configure a MikroTik for this purpose. 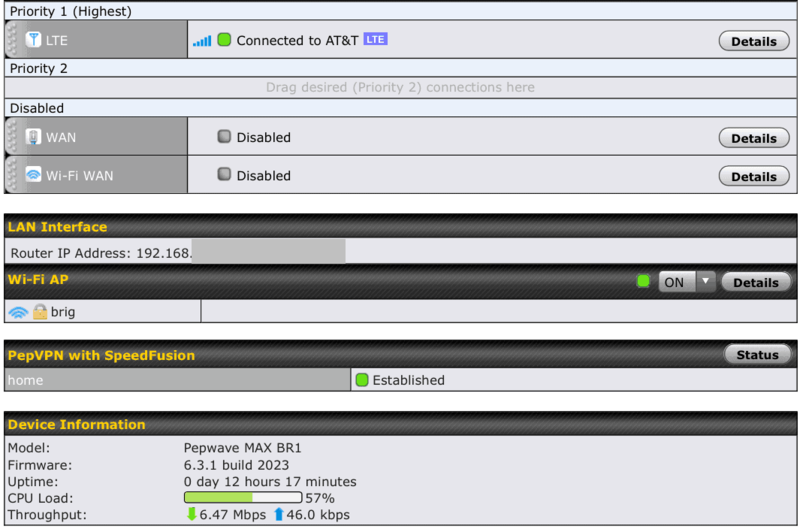 You also get great stats on the connection and usage right in the interface. Overall, the MikroTik is a great device capable of amazing things, and serves the purpose better than Ubiquiti and other products for a lower price. It also supports 2.4 and 5Ghz networks, which most of the competition (if not all – I don’t know of anyone yet) does not support in a single unit. It’s single flaw is the complicated interface, which folks like Rogue Wave have simplified for the Ubiquti Bullet. At the core of everything I have done with networks is reliability. That means having multiple ways of ensuring things work, and on the boat, that translates to more than one way of connecting to a remote signal. Combining the Peplink’s multi LTE feature with the MikroTik’s remote WiFi gives me a ton of choices to ensure I’m always connected to the Internet no matter where I am. In the last 15 years of having some sort of Internet connection on the boat, this is the most redundant setup I have ever had, and while cruising the last 2 years around Puget Sound and the San Juans, I have never been disconnected from the ‘net as of yet. Each component of the system should be independent enough to be able to be upgraded or replaced if needed. None of the devices I’ve chosen depend on the others. I could easily remove the Peplink and replace it with a Cradlepoint or a home grown solution if I wanted to. I’m using standard ports and connectivity – Ethernet, SMA antenna connectors, DC power, etc. – which are compatible with a wide range of hardware. This also gives me the ability to upgrade and test new items as they come out without completely ripping things apart, as I’ve done with the MikroTik vs. Rogue Wave. While testing at home is also possible, there’s nothing better than dropping a bit of equipment in the real environment and subjecting the crew to testing while out on the water. Managing a network of any kind is a critical factor in ensuring it runs well. Too often I see network implementations both on boats and for large scale companies that overlook this critical part of the system. For my boat network, having the Peplink management interface is fantastic, but I take it one step further and use their inControl2 interface. This provides a web-enabled view of the devices I have in my network, centralized logging, user statistics, and alerting and monitoring. If there is a problem with a port, connection, or VPN, I get an email immediately, and can see visually what is working / not working. I can also see performance trends, graphs, information and details on how the devices are working, as well as when their support contracts are due. All of this is free with the Peplink device. Accessing the boat from anywhere in the world is a requirement for my design as well. I have several devices on the boat, including an iKommunicate and Raspberry Pi running SignalK, that provide critical information such as battery voltage, temperatures, and status of shore power that I want to monitor in case of an emergency. In addition, I use SmartThings to drive on-board heaters in the winter, and ensure things are safe and sound – it requires Internet access, and when something alerts me, I need to be able to connect remotely as well. 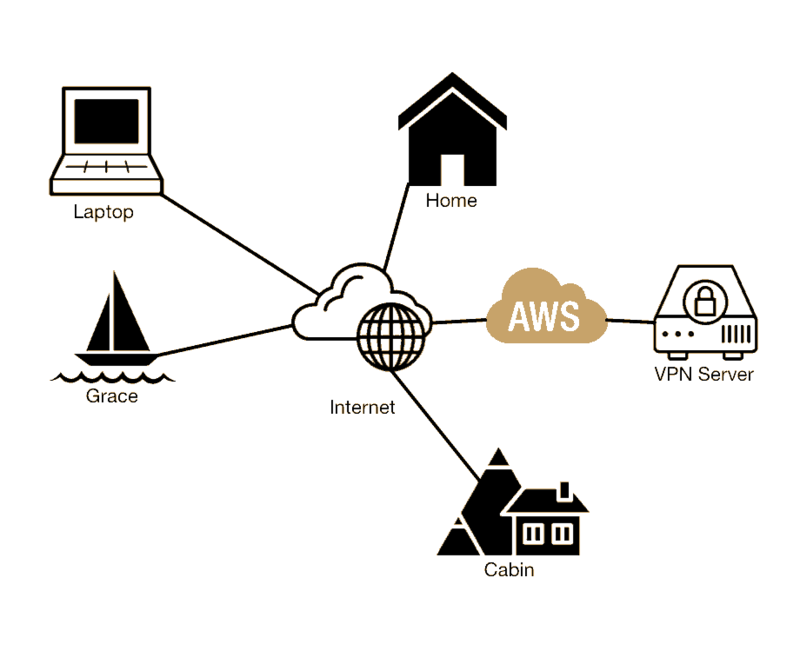 The Peplink connects via VPN to a remote server in the Amazon (AWS) cloud. This same cloud has connections from my home, and the family cabin in Eastern Washington. A bunch of firewall rules and other controls exist to prevent the average user from accessing everything. However, I can access pretty much everything, from everywhere. While sitting at the cabin, sipping my coffee on a winter’s morning with bone chilling temperatures, I can access everything on Grace without any crazy connections or risky ports open on my firewall. Traveling in Singapore, I can connect back to the boat and see how much water is in the tank, all safely and securely. While I am pretty good with networks and computers, I still want a good organization to back the products I install, and quality ways of getting support. I am also a big fan of online communities that enable you to find solutions and interact with both the people who make the product, and other users who use it. It shows the true side of the company and the product where they can’t hide from bugs and problems. There are two companies who have some of the best user forums I’ve ever come across – Peplink and Ubiquiti. Both have vibrant communities with representatives from the company that continually participate in the conversation. I’ve posted a number of threads in both, and had great conversations about configurations, bugs, features, and more. They’re very honest, and admit when there is a problem in their product, which is hard to come by nowadays. That alone provides me with a level of comfort that you can’t get most places, and keeps me coming back as a customer. Smaller company – support takes a lot longer, and they just can’t put the resources behind firmware updates and fixes that the bigger companies can. Price – some of the components used in their configuration cost less than $80, yet are sold for $200-300. Custom firmware – usually very restrictive and weird UIs. Only has features that they think boaters would want to use, others that the hardware supports are restricted or not available. Reliability – constant failures and general reliability issues. That being said, if I wanted something that was almost as robust as what I have now, I would go with a Wirie solution, potentially their SIM enabled device. Fair warning, though that the device does not fail over between SIM and WiFi without manual intervention, like the Peplink does, and they have far fewer router features which would make my setup challenging. 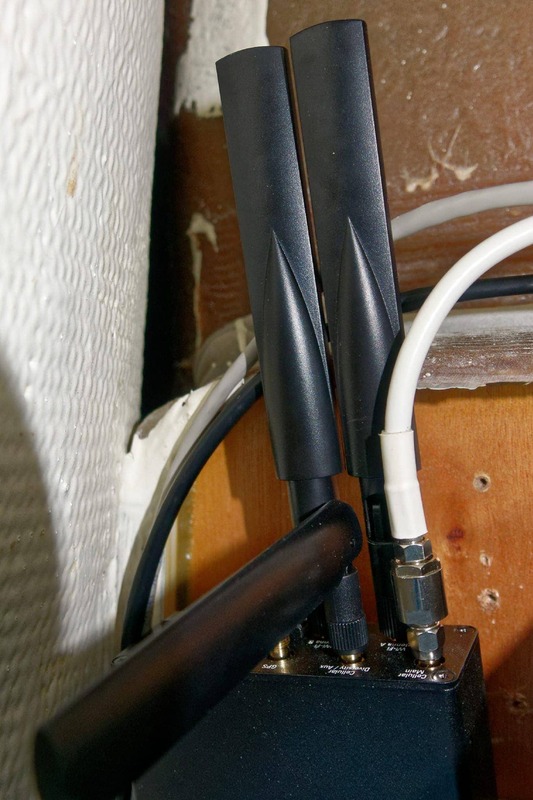 Non-marine solutions, such as your average home router, work very well, and are cost effective. Most non-tech boaters I know use solutions in this class, and don’t seem to have a ton of problems. However, they usually are only able to use remote WiFi signals, and do not have LTE or cellular connections. There are some solutions that will leverage a USB-connected device for this, but they are not mainstream. Peplink has a ton of other solutions such as the SOHO and Balance One which I’ve used and also support USB cellular devices such as a MiFi or dedicated dongle. Cradlepoint is a terrible company in general, and their product has become bloated and problematic. They have very little community support, unlike Peplink, and are generally overpriced. Many of the features you get for free with Peplink, you would have to pay hundreds more to get with Cradlepoint. I know of several other friends who abandoned Cradlepoint because of poor customer service and problems. MiFi’s and JetPacks are great, and I know many boaters that use them, but they don’t provide any redundancy, and usually have limits on how many devices can connect locally. They also have no Ethernet connectivity. They also use LTE networks, and usually you will have a data cap on them which you’ll quickly exceed with 5 heavy users on a wet weekend when no one wants to go outside. MikroTik has some solutions that can be used for the local WiFi and SIM/LTE stuff, but they are very complicated, and very difficult to use. Upgrades have completely broken functionality, and general hardware and signal strength is not as impressive for their AP products as the one I’m using. UniFi does not have solutions in this market anymore. Home built is great, but has many other issues – lack of the same redundancy and features, reliability, etc. They definitely are cheaper! All of that being said, I love my setup – it’s been rock solid wherever I am – underway, at a remote anchorage, or at the home marina, and I will always continue to enhance and iterate components and pieces as technology gets better, but the core bits will likely stay the same – a world class router combined with a WiFi repeater. I’d highly recommend all of the pieces to anyone who wants a great on-boat network with maximum flexibility and capability. 3D printing is nothing new to boats, but I think the potential for people to create new products and ideas is just beginning. I've printed parts and pieces for various projects, but hope to create some actual products that could help boaters.